Villy Customs, a Dallas, Texas-based bicycle brand, has raised $10k via Rock the Post. The company intends to use the funding to acquire all the necessary parts and materials to build a new limited edition line of bicycles called “ReflectaGlow”, which will be offered in a variety of colors including (but not limited to) Hot Pink, Fluorescent Orange and the Shocker Yellow. 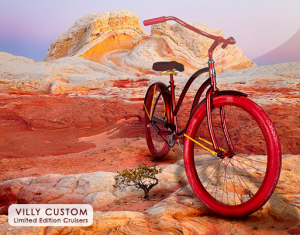 Led by Fleetwood Hicks, Villy Customs offers customers the opportunity to design their custom bike online as well as to browse through pre-built classic and elite beach cruiser bikes, and companies to choose their branded, personalized bicycles. The company also participated in ABC’s Shark Tank and raised $500k from Mark Cuban and Barbara Corcoran (see their story here).